Arugula pesto can be used for both a pizza or a pasta topping. Feel free to experiment — a pizza can be your canvas. Pulse pesto ingredients in food processor until smooth. 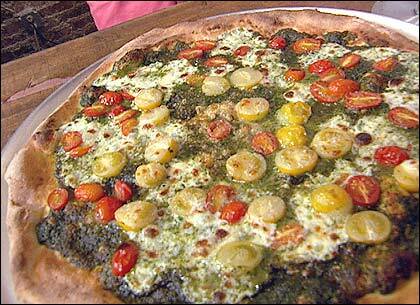 Spread pesto evenly atop prepared pizza dough, leaving 1/2 inch around edge. Top with both yellow and red grape tomatoes. Sprinkle generously with parmeggiano reggiano cheese. Bake on a pizza stone at 425 degrees for about 10 to 12 minutes until cheese melts and crust is golden brown. This segment appears in show #3009.